The lawyer Álvaro Noboa talked on Radio Tarqui about his experiences and political life since the year 1998. About the dirty war he has received and the political persecution he is suffering. He also talked about his future campaign as president of the country and his government plan to create wealth and distribute it adequately among the Ecuadorians. He also dialogued about the CNE signatures and his call to the Ecuadorian Youth to become PRIAN assemblymen. This event will be realized at the facilities of Industrial Molinera, at 16:30, on Saturday September 22th, 2012. HERNÁN HERDOIZA: We have received an interesting proposal to be able to make contact with a businessman, a politician, an attorney. He’s an Ecuadorian, logically, who since 1998, has been constantly present in the political arena. I am referring to attorney Álvaro Noboa, who is already with us via telephone and we say to him, Counselor, a very good morning. ÁLVARO NOBOA: Good morning. It’s a pleasure for me to be with you today, and we also greet those who are listening to us at this moment, let’s go to the interview. HERNÁN HERDOIZA: Yes, of course, Counselor. Since 1998, I was saying, that was the beginning, your entrance into the political arena. How would you, or what overview, for example, what experience have you drawn from those four attempts? ÁLVARO NOBOA: Well, that politics, unfortunately, even if it gives us the power to change a country, is a tortuous road full of traps, and full of falsehoods. In 1998, I won the elections, and they committed fraud against me; in 2006, I won against Rafael Correa in the first round, and the MPD, León Roldós, Pachakutek, the PRE, Sociedad Patriótica – which gave freedom of vote to their people – voted for Correa. Now they are all enemies of the government. They say that politics is the struggle for power. Effectively, it is a struggle, it is a war, it is a struggle with a lot of dirty war. In each campaign, I have suffered from the fact of them inventing something in the world of the dirty war in order come at me with it ceaselessly and they blur the goals that I would like for the country, which is to transform the country into a wealthy middle class country where poor people will be able to be middle class via education, via better jobs, via investment, where they are able to have a cement house, where they are able to have cars, where they are able to have university degrees, healthcare, neighborhood security, like the middle class in Chile has, like the middle class in the United States has. HERNÁN HERDOIZA: That is Counselor Álvaro Noboa’s aspiration. You said that politics is a tortuous road, tricky, a dirty war many, many times. Thos examples, those cases can also occur within the one’s own party? ÁLVARO NOBOA: They occur inside the party and outside of it, because part of the dirty war is that governments often try to corrupt the party’s own members so that they desert, so that they betray, so that they are “turned”, as they say on the streets, and therefore, this war occurs both inside the party and outside of the very same ranks of the party. It makes it very difficult. It’s not like a business, a radio, where everybody is working together for the common good. Here, many times, you don’t know who you are working with; you don’t know at what moment a government employee is being bought, you don’t know at what moment they are, well, planning a betrayal. Remember, in history Julio Caesar died in the Congress at the hands of his best friends, including at the hands of his adoptive son, Brutus. So it’s one of the dirtiest wars there is. HERNÁN HERDOIZA: Counselor, Álvaro Noboa’s milieu has been torn apart. Men who were very closely tied to your political participation have left. Will it affect in some way your upcoming participation, if it comes to that? ÁLVARO NOBOA: Not at all, because it’s Álvaro Noboa and the List 7 who brings in the votes. If you see one of the motives for desertion, it’s when I put out a call to the youth, because half the country is young people, 18 years and older. Therefore, I think that half the Assembly has to be represented by young people, because this is a democratic country. That’s the reason that many of them, seeing themselves being displaced, have wanted to leave the party. Others out of fear, others because they have let themselves be turned. There’s been a little bit of everything. But none of them brought me votes. If you measure it across the ticket, the 7 ticket and Álvaro Noboa have always got more votes than those that have gotten from me. HERNÁN HERDOIZA: 7:38, with attorney Álvaro Noboa commenting here, via Tarqui, with me, with Erika Zapata and with Jorge Aguirre, who also want to share in, that’s what we agreed on. ERIKA ZAPATA: Counselor, a very good morning, in this multi-diverse Ecuador, how can equitable systems of distribution of wealth be constructed in order to reach you goal of having a wealthy middle class? ÁLVARO NOBOA: The first thing that needs to be done is create wealth. Before distributing wealth, wealth needs to be created and I am going to show the way to create wealth. And I will also go on to answer your question about how to distribute it. In order to create wealth, you need for the producer, whether he calls himself a worker, farmer, fisherman, tourism person, whatever, to be a trained person. That training has to be specialized. We are replete with lawyers, with doctors, with engineers, but being a banana producing country, we don’t have a first rate school for training in banana production. Honduras, a country much smaller than our own, has the best school for banana production when it should be us. In tourism, every tourist who comes to the county represents one Ecuadorian who attends him. That is a huge source of employment, but nevertheless, we don’t have a great school for tourism. We don’t have on in floriculture, nor for vegetable production, nor for rice, nor for corn, and it’s worse in the modern systems of production like computing, cellular phones, etc., etc. So that training has to come from two sources. One source, industry itself, the very same investor who one brings to the country. One has to require training for their workers of them. Normally, they do that; it’s to their own benefit. The second has to come from the universities. So a man who goes to work in telephones, that is going to make Blackberry telephones, like I heard the President of Mexico talking about, that half of the Blackberry phones are made in Mexico. So those Mexican workers are already specialists in making Blackberry phones, and therefore can demand much more in salary once they are trained. That’s where the distribution of wealth comes from. So that investors come, it’s very necessary to have judicial due process. That there isn’t any of this persecution in the Court system on the part of Economist Correa, on the part of the IRS, because they have control of the Court. They come, as if they were in their own homes, to imprison those judges who don’t find for them in issues like with El Universo, in issues like Bananera Noboa, etc., etc. That frightens off the investor, it has to end. The investor needs to know that if he goes to Court, he’s going to have a fair resolution and not that every time the state loses, the judge is going to be imprisoned, that they persecute him, they destroy him. And every time the state is wrong in taking this posture or that posture they have control of the Court from the outset that always ensures that they are in the right. With that, no one is going to come here. Taxes also have to be reduced so that it becomes attractive for investors, but without affecting the Treasury, because, in coming, just to say something, a hundred to one, the number of investors who come to the country, even though they pay a little less, when one multiplies it by a hundred, the Treasury is going to benefit a lot. That’s going to generate more wealth. It’s going to make it so that the worker can demand a better salary. The countryside is going to produce double in rice, in banana, in corn, in everything. And in producing double, or triple, they are going to have better income. There have to be better business policies. In the United States the corn harvests are bought by the government with certain floors, and below those levels the farmer isn’t affected because they buy his corn even though it is more expensive than on the market, but likewise, when the market goes crazy, like it is now, the government comes and sells that corn and even makes a profit. ERIKA ZAPATA: Counselor, regarding the issue of specialization in production, how many years would it take the country until it can count on a new model of education according to this need? ÁLVARO NOBOA: With a new model, it’s not much time. Generally, specialized degrees take two or three years, if they are university degrees, five years, but remember that a big part of this training is going to come from the very same industry that would install itself and that takes months. That doesn’t take years, that only takes months. JORGE AGUIRRE: Counselor, a very good day, this is Jorge Aguirre greeting you. The fact lies in drawing a line, and in order to do so, first we need the support of the party and, consequently that you register. Are you having problems with the National Electoral Counsel at the moment, particularly for the signatures? ÁLVARO NOBOA: We are going to be the party with the most registered signatures, and I am going to explain to you why. In the first revision, we already had 150,000 approved signatures. 157,000 are required, but we have submitted 200,000 additional ones for the second revision. If of those 200,000, only half are valid, we will already have 250,000 signatures. If, of those 200,000 a third a valid, we will already have 210,000 signatures, and there is no party, apart from Alianza País, which is a movement and not a party, that has that amount of signatures. JORGE AGUIRRE: All of that will be before next Monday, the 24th, which is the latest date. ÁLVARO NOBOA: Up until yesterday, or the day before, we already had 150,000 approved. Of the 200,000 additional signature, we only need that they accept 7,000 to be qualified. JORGE AGUIRRE: So then we can say that the PRIAN will be participating in the next electoral fight. ÁLVARO NOBOA: Not only participating, but with pride, it will be the biggest party in the country. HERNÁN HERDOIZA: Counselor, at this moment there are two candidates of a similar tendency, in your case as a pre-candidate and the pre-candidate Lasso. Being two candidates of the same tendency, don’t you see yourselves being mutually affected. ÁLVARO NOBOA: I am not of the same tendency as Lasso. He has declared himself a candidate of the right, I am a left-center candidate. If you remember, in 1998, my Vice-President was Alfredo Castillo, who was a retired communist, a reformed communist. I believe that in the social arena, my ideas are of the left; in the area of production, my ideas are of the right. They are very similar to the Chinese model, where in politics they are of the left and in the part of production, they are of the right. I also don’t see myself as affected by Guillermo Lasso, because I have, according to the last surveys which I do every 15 days, every month, Correa has 36%; Álvaro Noboa 21%; Lasso 3%; Lucio 2%; Alberto Acosta 2%. JORGE AGUIRRE: Those surveys, Counselor, are carried out by your team. ÁLVARO NOBOA: Things have been happening in such a way that it will lead to a second round between Correa and Álvaro Noboa, with the aggravating factor for Correa, for that reason he’s desperate to try to see how he can politically persecute me via Bananera Noboa, via putting a thousand hurdles in my way, the one with the signatures, he’s even affiliated me with Alianza País; I was affiliated with Alianza País. The persecution that we live under here is terrible for me, because he knows that in the second round he’s not going to have the PRE, the MPD, Pachakutek, and all of those people who helped him win the elections of 2006. He’s going to lose the elections in the second round against me. HERNÁN HERDOIZA: 7:49. With us, in accordance with what he has just said, a new center-left candidate, Álvaro Noboa. The surveys that you were referring to, attorney Álvaro Noboa, they are specifically carried out for you by your own team. ÁLVARO NOBOA: Yes, it’s my own team which makes it more reliable, because Mercanoboa does it, which is a marketing firm of Grupo Noboa, which is the same that has been carrying out commercial surveys for 40 years for our products and that employs a political methodology known by any marketing individual and, well, we spend a lot of money on supervision because the canvassers and freelancers, many times, in order to save money, don’t go to all the points, and they make voluminous samples so that the survey costs less. In our case, on the other hand, we don’t spare a cent. HERNÁN HERDOIZA: Counselor, in your five candidacies, what has been your total investment that you have made. In this case, will you keep investing more and more? How do you see this? ÁLVARO NOBOA: Mandela spent forty years trying to get that in Africa – I hope that Ecuadorians will admire me one day like Mandela for being the man who worked fifty years to achieve the eradication of poverty in Ecuador, and that it would become a middle class country like the United States and Chile are. ERIKA ZAPATA: Counselor, being a leftwing candidate, how do your rightwing ideas regarding production fit in? ÁLVARO NOBOA: In the same way the Chinese do it: in the social arena, to the left, and in regards to production, to the right. HERNÁN HERDOIZA: There is an internet page, Counselor, in which the statistics and votes for each candidate are shown – votaEcuador.com – and on that page they show you located in penultimate position, one before penultimate, below Mauricio Rodas and Fabricio Correa. ÁLVARO NOBOA: Of course. In 2006, Santiago Nieto also had me at third before last position only fifteen days before the elections. It’s part of the dirty wary that we spoke about in this interview. How can you believe I am at third before last and be the party with the greatest number of affiliates in the country and they are recent affiliations? How can you believe I can be in third before last when on three occasions I have gotten to the second round, and the people in the street tell me that they are going to continue voting for me over and over again. How can you believe that I am in third before last if I won in ’98 and I have beaten Correa in 2006? Santiago Nieto always called me a day before the elections and told me, “Álvaro you’ve made a comeback in these fifteen days: from third before last you’ve moved up to first place.” That’s what he said to me in 2006 in the first round. HERNÁN HERDOIZA: Unarguably it remains the moral to the story that the best poll is taken the day of the elections. ÁLVARO NOBOA: So it is. That’s the one that counts. ERIKA ZAPATA: Counselor, the form in which the Chinese mange their economic and political system, what kind of development does it guarantee for the new world? ÁLVARO NOBOA: The Chinese do what I am proposing. First the Chinese of today is the Chinese who knows how to produce clothes, telephones, cameras, even cars and agricultural machinery. The Chinese of 30 year ago didn’t know that. They trained that Chinese person by inviting him to multinational companies, among them, American companies, so that they took technology, they took knowledge back to the Chinese. Second, they took capital. China was a country without capital and they brought back capital in order to develop the world of the Chinese, in order, well, for them to set up thousands of industries. All that was done with investor’s money, not with Chinese money. They didn’t have the money to do that. There, yes, there is judicial due process given that they don’t go around expropriating nor persecuting investors. Instead they go around supporting and assisting. There is also security for the people in regards to, for example, they catch a drug trafficker, and they carry out what is called martial justice. They put him against a wall and shoot him. Here in this country, and in many Latin American countries, half the news is about traffickers, a terrible thing, and yet nothing happens. 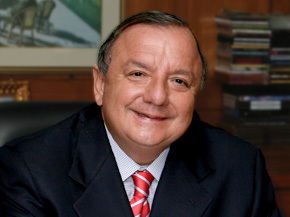 HERNÁN HERDOIZA: 7:57. You are going through a critical moment because of the confrontation with the IRS. You speak of persecution, the Director of the IRS speaks of evasion. What is the truth, what is the reality that the Ecuadorian people should know? ÁLVARO NOBOA: Well, I am going to read to the Ecuadorian people at this very moment how much they want to collect from me for the fiscal year 2005. Here it says that they want to collect $49,206,895 plus fines and interest. That is to say that it would have made profits of $250 million dollars. That same year, they charged Dole, a larger exporter than ourselves, $701,136. And from Chiquita, one of the biggest companies in the world, they collected $39,500. Well, those number make it so obvious that it is political persecution, because you cannot charge one $39,500 and another one a thousand times being that they are companies that export to the same markets, with the same transport costs, with the same volumes. Remember that in each campaign I have had this dirty war. Years ago, in another campaign it was Alamos. They proved in the case of Alamos that all the accusations were false. In another campaign it was the rise of bread, and so one listens. In this country where defamation is not a crime, they say anything, make up anything, construct anything, they repeat it a thousand times, and one lie repeated a thousand times at some points becomes a truth. foundations, which is what big businessmen the world over, like Bill Gates and other people have done since they can die at any minute and so they leave their businesses to trusts or foundations. Therefore, persecuting Álvaro Noboa in this regard is absurd. What Álvaro Noboa does have is a salary for working in those business of around $2 million dollars and from that he pays taxes, which makes him the highest individual taxpayer, and Grupo Noboa has a sales income of hundreds of millions of dollars on profits of tens of millions of dollars and pays taxes on those profits and it does it, in disciplined fashion, every year, and we have nothing pending. HERNÁN HERDOIZA: Counselor, with all of these issues that you have given us the details of, who holds the truth in this issue? The truth is something that needs to be managed with great caution. ÁLVARO NOBOA: Who holds the truth to what? HERNÁN HERDOIZA: Regarding these points. In particular in regards to the persecution, the signatures, against your party and above all the stability and also your decision. ÁLVARO NOBOA: You are the ones that have to decide the truth and every citizen, if a citizen sees that from one company they are demanding $49 million dollars because the business has the name Noboa, and from the other they are collecting $700,000 being the larger of the two, it will be the radio listener who will decide who holds the truth, and it will be the judges. Every judge who finds for us, and the same has occurred to the communications media, every time a judge finds for a communications company, they are fired, they are suspended, they are sent to jail and every time that they find for the state, they are promoted. Remember the El Universo case. Now it’s a question of the radio listener deciding who holds the truth. HERNÁN HERDOIZA: As with all in life, the supreme being and Ecuadorians, as well, in this case. Counselor Álvaro Noboa, we would like to thank you for these good thirty minutes that we have been able to share in your opinions, your truth, your ideas. Counselor, always at your command. ÁLVARO NOBOA: Thank you very much. For me, it’s been an honor and as there’s still five months to go before the elections, it would be a great honor and great pleasure to continue discussing national problems with you; my program of how to transform Ecuador into a country like the United States, like Chile, which would be my dream and the dream of all Ecuadorians. I would also like to take advantage of the opportunity to invite you, this Saturday, to a National Assembly here in Guayaquil, at 4:00 in the afternoon, and the following Saturday in Quito and there we are going to symbolically raffle off a car, we are going to raffle off a scholarship, we are going to give away a job via a raffle to the crowds. These are symbolic acts and it’s for that reason that I say, if business can do that, imagine that I, as president, will also be able to do so with state funds. HERNÁN HERDOIZA: 8:02 in the morning. We were with Álvaro Noboa, Presidential pre-candidate and like he said, hopefully we will have the opportunity in the next broadcasts to deal with and analyze the projects of his plan of government.